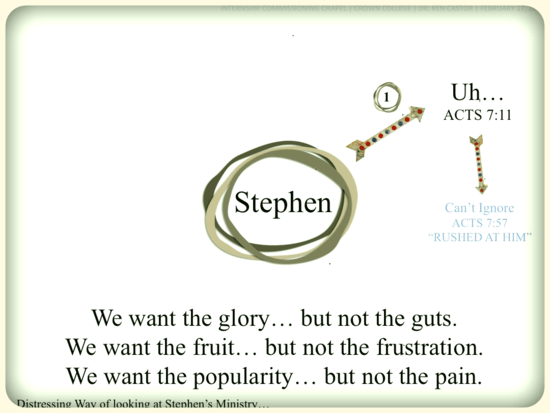 Outcomes in Ministry Part 5: What About Stephen? Is that really how ministry always goes? Philip had a really good friend, a man named Stephen. They were both men filled with the Holy Spirit. They were both leaders in the early church. They were both great speakers. They were both chosen directly by the Apostles to serve in ministry. They were commissioned and they were sent out. For the most part, Philip had a blissful experience in the fruitfulness of ministry. Stephen’s story, on the other hand, presents another picture of ministry that strains my selfish interpretation of Romans 8:28. You know, we want glory, but not the guts that it takes to endure. We want fruit in ministry, but not the frustration of planting and cultivating. We want popularity in ministry, but not the pain of identifying with broken people. Look at Acts chapter 7 verse 11. Stephen is preaching in the city and there were some men who started persuading other people against Stephen. They said, “We’ve heard him blaspheme against God.” And they started rumors to discredit Stephen and his ministry and to stir people up against him. Now Stephen is filled, and perhaps even more than Philip is filled, with the Holy Spirit. And yet, Romans 8:28, how does that fit into Stephen’s life? Philip had fled. I usually miss that part of the story. It goes on, 8:2, “Some godly men came and buried Stephen with loud weeping.” I usually miss that part of the story too. There was loud weeping. There was mourning. There was intense distress! It goes on, 8:3, “Saul was going everywhere to devastate the church. He went house to house, dragging out both men and women to throw them in jail.” I usually miss that part of the story too. Believers, following after God, were in tremendous distress. Everything was not working out as they expected. Outcomes in Ministry Part 6: So Who Was Better?